All goats have distinctive characters. Hebe has always had attitude, ever since she was a kid. She head buts strangers, dogs and Dormouse, but in a friendly way.She is a quite tough girl until it comes to kidding then she builds up a crescendo of screaming, even with a quite normal birth of a medium size kid. Last year was her first and she more or less ignored her kid the whole time, it had to stand on its own feet. This year she is all over it, licking, talking and nosing him. A good thing really it makes life so much easier. He will be suckling his Mum for ten to twelve week but after five weeks we will start to milk her in the morning after he has spent the night without milk but with access to concentrates. this natural rearing means we don't so much milk for the house, cheese making etc but its so much easier than bottle feeding six times a day. 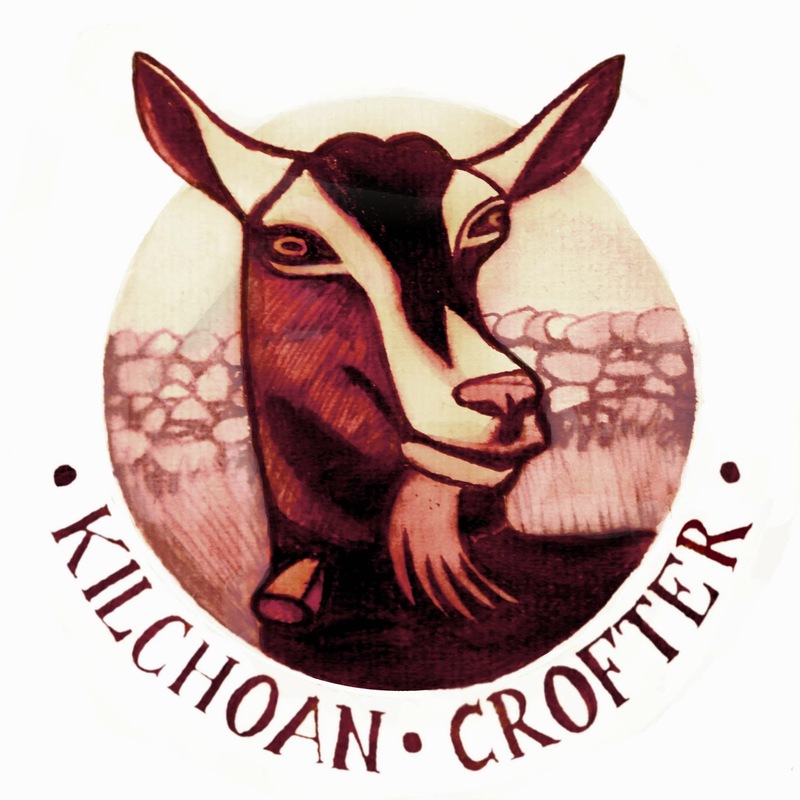 Goat cheese shortage - a niche market for "Kilchoan Crofter"? Last year at about this time there was a Europe wide shortage of goat cheese because of rising demand and falling production across Europe but particularly in France. In the UK there has been steady growth in demand for goat cheeses for over twenty years. It is a supply problem. The larger British producers have to import milk from Europe because it is Spring. Unlike cows, goats are seasonal breeders, most kids are born from February until April, the goats are dry for two months before they give birth and they only reach peak production ten weeks into their lactation. These are the technical reasons for the annual shortage there are others. Historically there is a prejudice against goats and to some extent goat-keeping in the UK. If you are not milking cows then its not real farming and goat keeping has been thought of as belonging to the realm of eccentric smallholders. The new SRDP proposals include support for food processing, cheese making is food processing. If we were French we would be thinking about co-operating to get our hands on that money. Co-operating by keeping goats here instead of loss making sheep then adding value and taking money directly from you, the buyers..
An opportunity to create native broad leaved woodland on the common grazing. The Ormsaigbeg common grazing covers 523 ha of some of the roughest most exposed grazing in Scotland. It extends from sea level up to 259m on Druim na Gearr Leacainn . Twenty three of us have a share in the grazing, my own share allows me to keep 11 ewes, 2 cows and half a horse up there. The northern and western boundaries are not fenced so sheep could, in theory graze as far away as the lighthouse 10 km to the Northwest. At one time all of the Crofters used their share and there was a paid Shepherd to herd them within the boundary. Today there are two graziers and if I include my occasional goat herding in good weather, three. So as far as the community is concerned there is not much benefit or amenity to be had. The new Scottish Rural Development Programme, "Crofter Forestry Scheme" offers an opportunity to turn this area into as asset rather than a liability. Individual shareholders or a group of shareholders can get together to create new native broad leaved woodland grant aided by the Scottish Government. A "Community Woodland" comprising native broad-leaves and perhaps some Scots pine along the line of the croft boundaries from Cuinlegum at the end of the tarred road down to the boundary with Ormsaigmor could restore a long lost landscape feature and wildlife habitat while creating shelter and winter grazing for hoggs ( ewe lambs) . A way-marked route up to the Glen Lochs would improve access for visitors and perhaps most important the trees would provide sequestration of atmospheric CO2. There is a downside; shelter for foxes, loss of some of the better hill grazing and some people prefer open hillsides without trees. There's also the ....., " its a waste of taxpayers money" argument. NB. The " half a horse" provision was probably because а whole horse was too big an investment for one Crofter. Although otters have five short toes very often only four of them leave an imprint. In these tracks you can just about see the imprint of the fifth toe on the last track in the image below. It's probably the left hind foot. Finding fresh tracks in the sand is just as exciting as seeing the live animal, you know it has been there and you haven't disturbed it. Its so nice to come across a migratory bird that isn't a threatened species. In fact it looks as if Whooper swans are increasing world wide. This pair, probably on their way to Iceland, where the British wintering birds tend to breed They were resting on Loch Doilean two days ago. a shallow peaty loch that drains into Loch Sheil. Some Whoopers do occasionally try to breed in Scotland so they may find the Loch Sheil wilderness to their liking. A true wildcat wouldn't have the white under the chin but she isn't a domestic tabby either. She is a wildcat hybrid. How do we know? Well we used a test developed from a study of wildcat skins in museums around the UK. Using the patterns, size and number of stripes on her sides, legs, tail and head, her tail characteristics and colour she scored as a hybrid. Mimi probably had a wildcat father or grandfather, we know her mother was a domestic moggy. You can see some of the differences on the chart. The true wildcat on the left (A) and the domestic tabby on the right (B).. There is a second diagram to differentiate hybrids from domestic cats. This is important so that hybrids of both sexes can be neutered along with domestics to prevent breeding with the surviving true wildcats. Mimi has been neutered. West Ardnamurchan is home to the "Wildcat Haven" project. The aim is to conserve the remnant population of wildcats and their genes by trapping and neutering hybrids and feral cats. Find out more at www.wildcathaven.org.uk . Its hard to believe that she is up to 50% wildcat. She is so gentle and friendly, except where dogs are concerned, they find her very scary. So far she has only been practising her stalking on the hens, no kills yet. Spring chicken - Bresse Gauloise get their first day in the sun. Two seasons in one today, snow and ice on Ben Tallaidh but warm and sunny in Kilchoan. It was the ideal day for the latest batch of chicks ( 4 weeks old) to get outside and get scratching. You can tell which ones are cockerels, they have combs, bigger more upright tails and they take the lead in any new activity. When they are first hatched they need a temperature of 32 - 33 C but now that they have feathers and a lower ratio of surface area to mass so the heat lamp can be raised and they can venture outside. The pullets start to lay at about five months old which is probably the best time to buy them if you want eggs for your own use. On the other hand if you hatch them and rear them you won't be bringing any parasites or disease into your chicken run.